6pm-dad just brought in fresh food-a large fish-dropped it in the nest and flew. Now mom is feeding babies and herself fish. As much fun as the nesting Bald Eagles are, there are lots of other birds either migrating in/through my area of Colorado or engaging in breeding. So I will start interjecting some of them in between Bald Eagle updates. 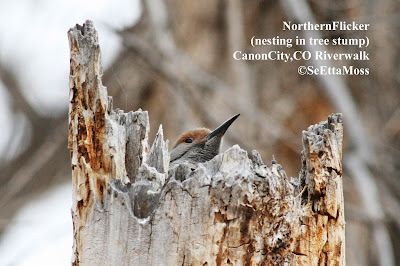 I spotted this Northern Flicker (red-shafted) in the top of this dead stump while birding on the Canon City, CO Riverwalk this week. I have seen Great Horned Owls nesting in the top of dead stumps before but not flickers.